Despite the fact that companies spend $124 billion a year on recruiting, they are still unable to find the best talent. Not only are organisations failing to choose the right candidates – Harvard Business Review (HBR) points out that as much as 80% of employee turnover is due to bad hiring decisions – but the candidates that companies are finding are both underskilled and prepared. As the graph shows above, a large majority of employers do not feel that recent college grads are well-prepared for the working world. 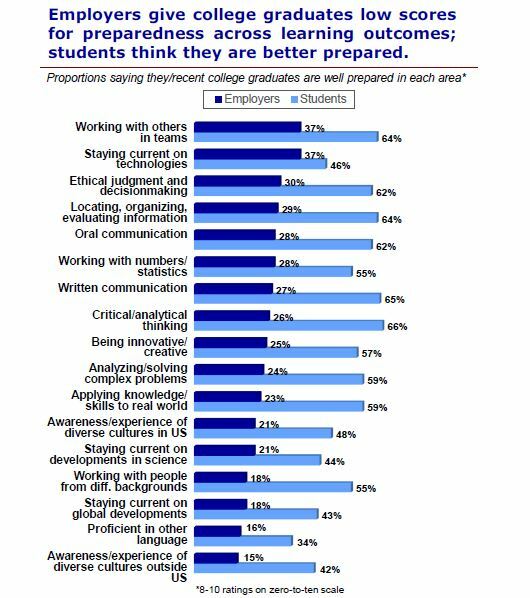 When it comes to critical thinking, written and oral communication skills, fewer than three in 10 employers think that graduates are amply prepared. The reason why companies are still unable to find the best talent is because the methods that they use (resumes, GPA’s and interviews) aren’t good enough. We millennials are all too familiar with today’s college recruiting process: submit a resume into some online portal, land a few interviews and maybe, just maybe, we’ll end up with a job offer at the end. As we all know, landing a job these days is more about luck than anything else. Not only do these methods indicate next to nothing about future success, but by relying on these methods, companies are ensuring that they fail to achieve the one thing they set out to do: find the best talent of tomorrow, today. “It is a quick advertisement of who you are. Yes, you read that correctly; one side of A4 paper is meant to be the “snapshot” of everything that you are and hope to be in life. Is it just me, or is there something inherently flawed and somewhat demoralising about trying (and failing) to ‘fit’ your life onto one side of A4 paper? On the one hand, we’re told to go out and embrace the world by throwing ourselves into different opportunities that will give us a myriad of amazing experiences. Then, we’re duly expected to take all of these larger than life, immensely colourful, intangible experiences and describe them in a few size 10 font bullet points. The message we’re getting from the working world is a little muddled, don’t you think? As you might imagine, this is an impossible task, yet we still obsess over our resumes because we cannot even apply to killer jobs or internships without one. Organisations will tell you that a resume gives them an insight into the top talent that they want to recruit. But, is this really true? The real answer is a resounding, no. Resumes are actually terrible predictors of job performance, and thus, are equally terrible at identifying candidates who might indeed be excellent job performers. This is because 49% of job candidates will lie on their resumes, and since companies often receive hundreds, if not thousands, of resumes for a single position, recruiters simply cannot give each individual resume a thorough examination. 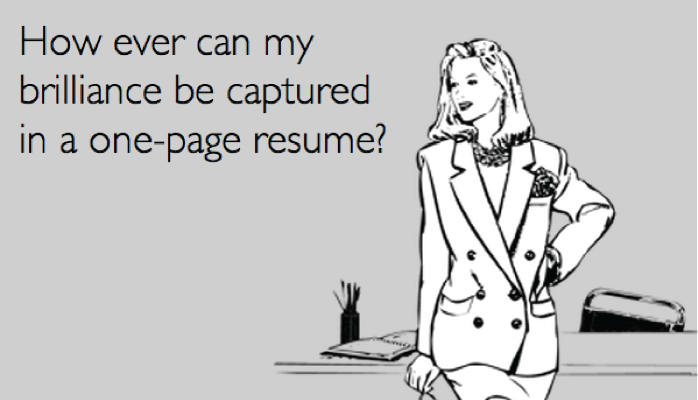 on average, just 6 seconds scanning a resume. How on earth can recruiters expect to understand who the best candidates are in the time that it takes to watch a vine video? The answer is that they can’t, and this is what forces recruiters to focus on meaningless statistics such as college GPA, where they often cut huge numbers of candidates who fall below a certain threshold. Again, this is an amateur move because college GPA indicates next to nothing about future success in the workplace, as pointed out by SVP of People Operations at Google, Laszlo Bock, in a recent New York Times interview. At the next stage of the recruiting process, candidates will face a multitude of different interviews with recruiters and current employees. Now, there is this notion that the cream always rises to the top in interviews, so that the best candidates, objectively speaking of course, will always be chosen. This could not be further from the truth, as interviewers are subject to their own biases just like they would be in any other situation. Tina Seelig, Executive Director for the Stanford Technology Venture Programs, talks about how a recruiter often makes their decision about a candidate within the first 90 seconds of an interview. “Within about 90 seconds [the interviewer] has made an assessment of you. then everything you say afterward will be viewed through that lens. Regardless of your performance after the first 90 seconds, everything that you say and do will be viewed through a biased lens. While this is certainly an improvement on the time taken to evaluate a candidate (90 seconds vs. 6 for resumes) this is a worryingly short amount of time to evaluate any candidate. As Gill Linton argues in his piece Why Job Interviews Don’t Work, you’d have more time for someone to get to know you at a speed dating event than you would in the college recruiting process. Surely, this can’t be right? personality traits, and culture fit? They can’t. In 2016, a study by the National Association of Colleges and Employers (NACE) estimates that the average cost-per-hire of one on-campus college recruit is $3,582, with this figure being even larger for elite school hires. Companies not only face costs from colleges to even come onto campus, but most organizations also devote large numbers of personnel to represent the company at a few schools. Then, most companies will fly out revenue-generating employees across the nation to attend different campus-wide events and conduct interviews. This whole time employees are off the clock, the expenses really do add up. While this average cost-per-hire ($3,582) is huge, it wouldn’t be so bad if these college recruits were staying at a particular company for long periods of time, but they’re not. In fact, they couldn’t be quicker to leave. According to Bureau of Labor Statistics from 2012, median employee tenure for workers aged 25 through 34 is just 3.2 years now—which is 1.4 years less than the median tenure for all employees. These high turnover rates amongst millennials only serve to drive up the exorbitant costs of these recruiting methods even further. The Society for Human Resource Management (SHRM) predicts that every time a business replaces a salaried employee, it costs 6 to 9 months’ salary on average. And so, for your entry level manager making $40,000 per annum, recruiting and training expenses are around $20,000-$30,000. If you’ve got new hires leaving every three years on average, this will really start to add up very quickly. What’s worse is that these costs are only going one way, and that’s up. A report from Bersin By Deloitte found that American companies increased their talent acquisition spending by 7% on average in 2014 as compares to the year previous – led by an increase to nearly $4,000 in cost per hire in 2014. How much more money will companies continue wasting with these ineffective recruiting methods? The worst part of the current state of college recruiting is that it does not have to be so painstakingly ineffective and expensive. In fact, there are far superior recruiting methods out there, they are just not being used. One of the best recruiting methods is psychometric testing, which is designed to measure candidates’ suitability for a role based on the required personality characteristics and aptitude. Why is psychometric testing such a better solution? Because it does the three things that current college recruiting fails to do: identify the best talent and predict future job performance all without breaking the bank. Ji-A Min, Head Data Scientist at Ideal, points out that utility analyses (i.e., analyses of a process’s practical economic value) indicate using a valid selection tool like psychometric assessments increase annual sales productivity by 21% per rep (Farrell & Hakstian, 2001). Moreover, in When Hiring, First Test, And Then Interview, John Bateson also illustrates the massive upside that using psychometric testing first provides to major companies. the bottom 25% of applicants before reviewing CVs. Let’s assume that the average manager earns $20 an hour. In this one example, psychometric testing would have saved this supermarket chain just shy of $1.5 million dollars in one recruiting cycle. The most shocking statistic, however, is that according to SHRM, the majority of organizations (82%) do not use personality tests in the hiring or employee promotion process. This failure to utilize the most effective recruiting methods is not only hurting companies wallets but is also killing their most important asset, their talent pool. All in all, it is clear as day that companies across the globe need to reevaluate their college recruiting processes. Currently, companies are using the wrong methods to evaluate talent and as a result, are suffering both internally and financially from huge turnover rates, underskilled hires and massive recruiting bills. Since far superior methods recruiting methods do exist, the only question that remains is: how much longer will major companies continue to ignore the simple answer to the billion dollar recruiting problem? Only time will tell. So keep in mind that organizational assessments administered by organizational psychologists is a first step. This will identify the corporate culture as well as exactly what personalities need to be engaged. Then certain very comprehensive assessments that address specific skill sets and future management capabilities should be next. This essentially is the deep dive that will likely insure or at least greatly improve the success rate of present hires. Often the HR professionals are not qualified or could be restrained by budget utilizing the best tools available for the process. Organizations that essentially cheap out by engaging low level assessments get exactly what they pay for. an analyses that is not worth the paper that it is printed on! Those that prepare the budgets that the HR department must abide by are usually professionals that have NO background or understanding what-so-ever what the value of the assessments are or could be. Budgets and management as well as hiring decisions are made by those that offer only a very limited accommodation to the HR departments, so in essence their hands are tied. And for those that have made such poor and uneducated decisions then suffer the consequences of hiring poorly aligned employees that had no business even being considered. This is a cycle that manifests itself by various cognitive biases that are then reinforced by bad decision making by those that manage the companies in the first place. The very best companies circumvent such a poor decision making process by investing in their HR departments training and utilizing the best assessments that are administered by professional firms that are highly specialized in this process. Those firms offer the very substantive foundation that the HR department can rely upon, such as synergized platforms, excellent training, and array of personalized and customized assessments that can help with the proper and more accurate alignments that will win the day.